Office 365 is one of the most deployed productivity tools today, used by 85% of organizations. Once Office 365 is deployed however, it is not the end of the journey. Many organizations overlook the fact that SharePoint Online, Teams, OneDrive, Yammer and the many other Office 365 workloads require appropriate governance. It’s time to maximize your ROI and get the most out of your Office 365 deployment. Applying a governance process doesn’t have to be painful with Netwoven Govern 365 (Office 365 Governance Application). It helps you implement automated governance policies to get the most of your Office 365 deployments. Achieve the right balance between user empowerment and administrative control. Self-service and faster provisioning, consistent branding and user experience, better information findability lead to higher team productivity, more collaboration and ultimately higher project ROI. Allow self-service site creation without giving up control. Build your provisioning approach from a proven template rather than a blank canvas. Minimize your IT overhead through use of a Managed product. Make securing your information easy. Consistent application of security policies helps you restrict information access to the right employees and partners. Achieve better user experience and better project ROI for all your Office 365 experiences. 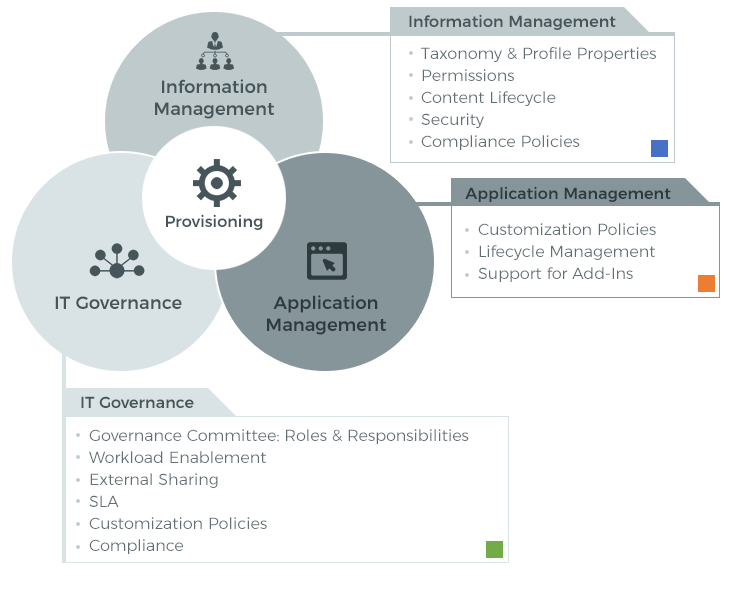 Find the right balance of user empowerment and administrative control. Institute fine-grain governance policies with minimum administrative burden through automation, pre-configured forms and templates to manage your entire Office 365 lifecycle. Pre-seeded templates, provisioning forms, workflow process and more so that you can start 85% of the way there. Create a new template from existing sites. Extract templates from existing SharePoint sites with the click of a button. Use templates to apply branding, web parts, information architecture, settings, permissions, and sharing constraints. SharePoint Sites, Teams, Outlook Groups and Yammer Groups are all supported. Not everyone has an Office 365 PhD. Help content owners select the right workload for the job and gather the necessary information through intuitive forms to ensure the ensuing content life cycle process can be automated and tuned. Implement review, approval, training and other flows into your provisioning process. Track provisioning metadata in a provisioning directory (ex: site owners, department, cost center). Visualize your content inventory with powerful Power BI reports that support slicing and dicing your inventory with data, including your custom provisioning metadata. Use intelligent triggers to maximize the efficiency of your disposition process and take advantage of granular disposition activities to refine the process by which you retire your more complex O365 containers. Due to the rapid adoption of Office 365, including Microsoft’s SharePoint, Groups, and Teams, it’s more important than ever for organizations to have effective centralized governance. Users must be able to quickly and safely provision new locations to collaborate without IT losing control of the environment. Netwoven’s Office 365 Governance Application is a robust solution for addressing the governance of Office 365. Users can now self-provision and IT Admins can now appropriately track and monitor the provisioning, without losing control of their Office 365 environment. Netwoven is committed to providing support and/or correct bug-fixes as soon as reasonably possible to meet our clients’ business continuity needs.